SPCC is excited to announce that the 2016 Bridging the Divide (BtD) Suicide Awareness and Prevention Summit will be heldMay 4-6, 2016, at the Regis University Lowell Campus. This year's theme is, "Pathways to Resiliency, Strength and Recovery," and this state-wide conference, hosted by the Suicide Prevention Coalition of Colorado (SPCC) will examine promising evidence-based practices that decrease the likelihood that suicide will occur, assist those who struggle with suicidal thinking, and help survivors of suicide loss regain their equilibrium following a loved one's suicide attempt or death. Resiliency: This track will address the concept of resiliency and how it relates to suicide prevention, mental illness, and suicide loss survivors. Recovery: This track addresses the ways in which people achieve, demonstrate, and maintain recovery from risks, trauma, loss, and suicidal thinking or acts. Research: This track addresses promising research developments in the field of suicide prevention and mental wellness. We are eager to showcase ways in which our colleagues are using research to inform the development of best practices, and working to promote resiliency and recovery for at-risk individuals. For more information and/or to submit a proposal, please click this link to download the Call for Presentations. Submissions are due by close of business on February 1, 2016. Speakers will be notified by February 16 if their presentation was accepted. 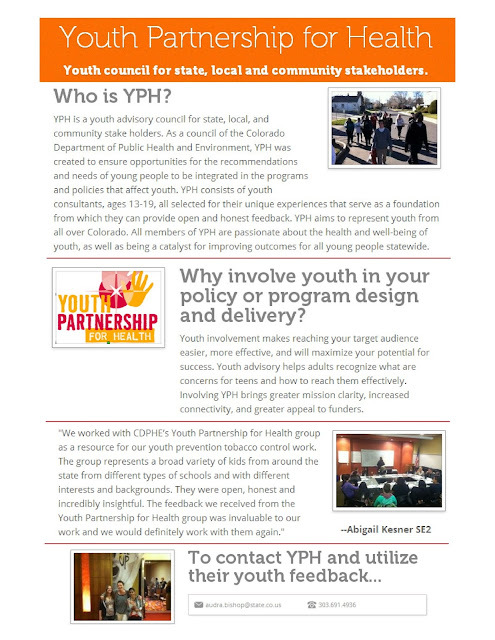 Need youth feedback on your programs or ideas?